Having trouble convincing the significant other that the 55-inch TV is an asset in the living room? Samsung’s new TV line-up brings stealth to the TV, as PAT PILCHER discovers. After I left school, one of the many jobs I worked involved selling hi-fi gear. It was there that I noticed a curious trend when couples bought a new TV. The male side of the purchasing equation typically wanted the biggest and brightest TV he could afford, while the female buyer simply wanted something that wouldn’t take over their lounge. This trend was so noticeable that we began to call it ‘WAF’ – wife acceptance factor. Back then a TV was typically 28-inch CRT TV that weighed about as much as a windowless building. Since then, it appears that WAF has very much become a thing. I say this because of Samsung’s latest TV. Their newest QLED TVs feature what they call Ambient Mode. Using a smartphone (Android or iOS), users install the Samsung SmartThings app. With it, they can then snap a picture of their new Samsung TV on the wall. 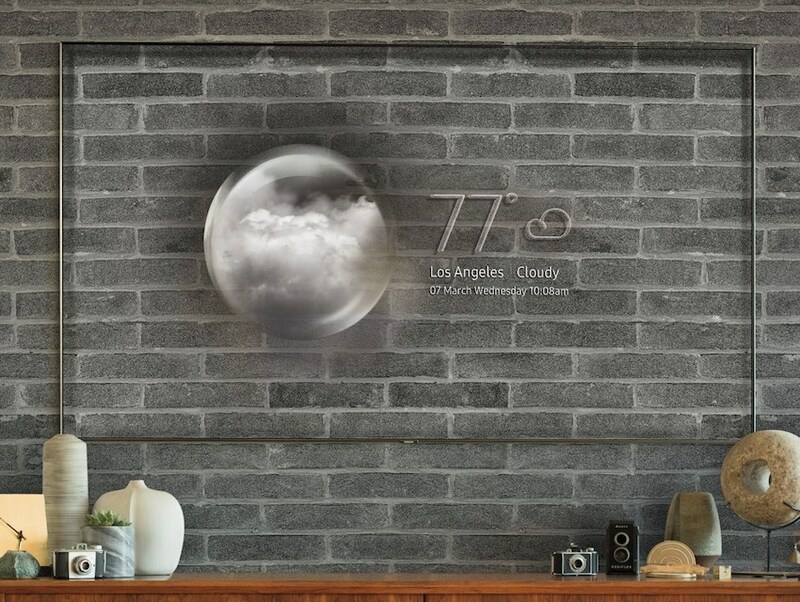 The app cleverly uses their wall’s texture/pattern/colour and displays it as the TV’s standby mode background (you can tweak colour and brightness, so its on-screen image more closely matches the wall behind it). It sounds gimmicky, but it does work. Ambient Mode does indeed make that rectangular black hole vanish. The effect is uncanny and at Samsung’s reveal this week, I ended up doing a complete double take. The near bezel-less design of their new TVs makes for a almost invisible TV when Ambient Mode is set up and running. Using a persistent type of LCD also means power consumption drops by around two-thirds when in Ambient Mode. All told it’s a clever move. By crafting large TVs that can seamlessly blend into their surroundings, Samsung may have achieved the near impossible feat of designing a WAF-certified TV. It isn’t just all about Klingon stealth capabilities either. Samsung’s new SmartThings app also sees their 2018 line-up becoming a hub for smart devices. When installed on the smart TVs, it essentially acts as a central hub that can control a multitude of smart devices connected to the SmartThings system. So far, these smart widgets include Amazon Echo, Ring Doorbell, and Philips Hue lights, plus Samsung robot vacs, fridges and laundry appliances. The new TVs are designed to be much easier to wall mount, thanks to a tiny semi-transparent cable that acts as an HDMI connector and now also supplies power to the TV. This should mean less fiddling about with wiring in the wall plug behind the TV. As with previous models, the TV’s tuner and other smarts are housed in an external breakout box which has all the inputs for hooking up games consoles, set-top boxes and so on. 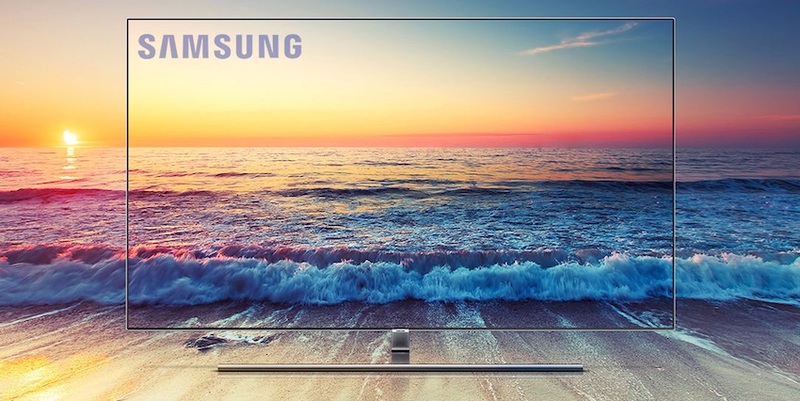 Samsung’s 2018 TV line-up consists of five new models, ranging from 49-inch screens to the stonking great 88-inch beast. The 55-inch QN55Q6F is aimed at budget buyers, while their whopping 88-inch QN82Q6F model occupies the high-end. Regardless of which model buyers purchase, the offerings on display all rendered impressive on-screen footage. The QLED/LCD combo delivers vivid colours while some impressive image processing hardware makes for smooth on-screen motion. The top of the line models also feature 500 local dimming zones, resulting in inky deep blacks and vivid bright whites.